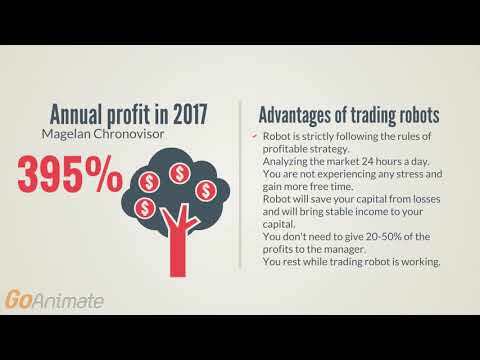 Minimum quantity for "Trading robot Magelan Chronovisor v.10.0 for Meta Trader 4 and Meta Trader 5" is 1. This advisor is one of the best software that is created by our company and is constantly improved. Results of trade and tests speak for themselves! Magelan is a profitable and risk-less advisor for forex trading. First version of this advisor was released in 2010. In Spring 2018, new 8th generation was released. Main advantage of Magelan v.9.0 Chronovisor, as in previous versions, is a possibility for maximal profit fixing of opened position taking into account current and projected trend movement of currency pair. Difference in 8th advisor version is that new modules of targeted profit and loss hedging were added, as they proven themselves in HEDGE GATE advisor. Most advisors are fixing the profits on pre-determined fixed take-profit. Which in most cases gives an opportunity to take only partial profit of current currency pair movement, or make losses on quote reversals without touching the line of take-profit. In Magelan v.9.0 Chronovisor system of algorithms is used, that calculates market activity for precise market entry and to exit the market when reversal, correction or lowered market activity towards the profit of opened position signals are present. If after closing the position in profit, after pause or small corrections, currency pair still continued its movement and there are sure signals for trend continuation, Magelan v.8.10 Chronovisor will enter the market again and will continue to trade by trend. Also, version 9.0 has a new and unique filter added, that excludes false market entries against the trend. This filter compares open and close prices of the day, week and month, forming the so called triangle sides for each period. When figures are formed, advisor filters most of the false entries or entries which can lead to profit expectations not inside the trading day with the position being transferred to the next days. Those who like constant market entries and scalping strategies, can disable this filter. But the position will be opened only when signal of the formed triangle will be confirmed by the module of formed candle figures analysis, including ended "pin bars", chosen and filtered by our "catalog of profit pin bars". In 9.0 version we've added a filter that limits trade opening against the trend, when quote movements passed all calculations and filters, but is located beyond specified levels of support and resistance, where a profit guarantee is decreasing.This filter is not enabled with all trading settings provided for this advisor. As not all instruments are in need of this filter and allow to gain substantial profits without using the support and resistance levels. 2018/06/15 - new trading settings update for the Magelan Chronovisor v.9.0 on MT4 and MT5. settings for AUDCAD,AUDCHF,AUDJPY,AUDUSD,CADCHF,CADJPY,EURCAD,EURGBP currency pairs were updated. The results of trade adviser Magelan Chronovisor for 2017. The results of trade adviser Magelan Chronovisor for 2017. The profit was 397%.